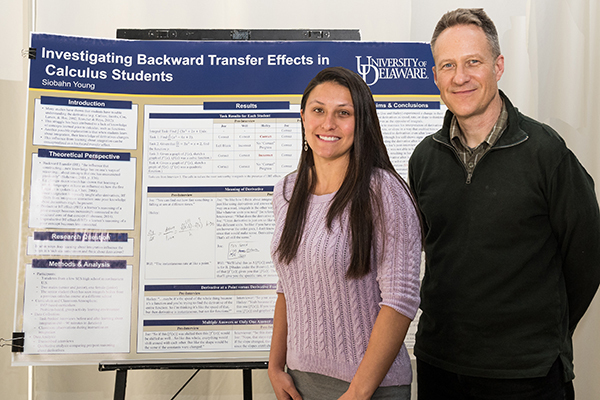 Charles Hohensee and doctoral student Siobahn Young with her poster on "Backward Transfer." 2:08 p.m., April 30, 2015--The American Educational Research Association’s (AERA) Special Interest Group for Research in Mathematics Education (SIG-RME) has awarded Charles Hohensee, assistant professor of mathematics education at the University of Delaware, the SIG-RME Early Career Publication Award. The AERA SIG-RME Early Publication Award recognizes outstanding mathematics education research published by scholars within five years of receiving their doctoral degrees. President Barack Obama recently presented the National Medal of Science to University of Delaware alumnus Rakesh Jain. Rosalind Johnson, assistant dean for student success in the NUCLEUS Program in UD's College of Arts and Sciences, was presented the John Warren Excellence in Leadership and Service Award during a May 26 ceremony. The award was announced on April 13 at the National Council of Teachers of Mathematics Research Conference in Boston and April 18 at the AERA SIG-RME business meeting in Chicago. Hohensee received the award for his 2014 scholarly article titled “Backward Transfer: An Investigation of the Influence of Quadratic Function Instruction on Students’ Prior Ways of Reasoning about Linear Functions,” published in the academic journal Mathematical Thinking and Learning. The article discussed middle school students and the phenomenon of “backward transfer,” a term that describes how new learning influences an individual’s prior knowledge. Most teachers expect new learning in the classroom to reiterate or supplement a students’ prior knowledge or skills. Hohensee, too, expected that result but instead discovered that new lessons sometimes negatively affected students’ prior knowledge. One seventh grade participant in the pilot study struggled to complete a familiar math problem on toy planes after participating in new lessons. “Matt did a great job the first time he worked on a math problem involving the constant speed of a toy plane. However, after participating in some lessons about constant acceleration, he was given the same toy plane problem, and this time, he got quite confused by it,” said Hohensee. After this surprisingly discovery, Hohensee conducted a study to systematically examine the negative effects of “backward transfer” and identify methods that would allow mathematics teachers to prevent those effects. His results showed that it is indeed possible to prevent the negative influences of new material and that teachers could even encourage positive, productive influences by modifying new lessons. After participating in a specially-designed lesson on a new math topic, five out of seven students in the study performed better on a previously encountered math task. After conducting this research, Hohensee interviewed other Delaware mathematics and science teachers about “backward transfer” in their own classrooms. He discovered that they, too, observed the negative influences of new material on prior knowledge. “Findings from my study have implications for how we design lessons in mathematics and across other content areas  at the local level of classroom teachers and at the global level of curriculum developers,” said Hohensee. He plans to continue his research on “backward transfer” by working with Delaware K-12 mathematics teachers on redesigning lesson plans to limit unproductive effects.